Reprinted with permission from The Eli’s Cheesecake Cookbook: Remarkable Recipes from a Chicago Legend (Agate Midway, 2015). To make a sabayon, place 2 cups water in a saucepan over medium-high heat and bring to a boil. Place a medium heatproof bowl on top of boiling water and add 1/3 cup sugar and egg yolks to bowl. 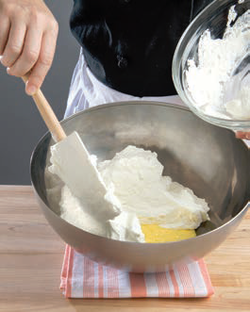 Whisk vigorously until fluffy ribbons form and mixture reaches 150 degrees. Remove from heat and whisk in bloomed gelatin until mixture is fully combined. Set aside. In the bowl of a standing mixer fitted with paddle attachment, beat cream cheese on medium speed for 2 to 3 minutes until smooth and free of lumps. wooden spoon or silicone spatula, stir until fully combined. Fold cream cheese mixture into sabayon. Pour immediately into serving containers to set before serving. Refrigerate for 4 hours or overnight.